In part two of the Joel Salatin series, Maddy describes how Polyface Farm designs its sales and marketing strategies and ventures and why it is so successful. This understanding of 'tribe' can be applied to any business large or small. Yesterday I described Joel Salatin’s pattern for carbon farming at Polyface Farm. He mob grazes cows and then follows them with chickens to spread the pats around, manure the pasture and eat the bugs, He regenerates pastures and forest areas with pigs in a ‘tractor’, fattening them in the process, grows shiitake under the eaves of shed, offer farm tours for kids, even runs an online food drop service. This is the ultimate stacking of synergistic, complimentary, seasonal micro-enterprises and it makes the farm $2,000,000 a year and employs at least 22 people on the farms. Today I am describing the sales and marketing ‘pattern’ that holds these stacking synergistic enterprises together. In my last blog I am going to describe his attention to detail, especially with cost centre analysis and categorization. That’s accountant speak but it is key to a successful business, on or off the farm, and Joel is the son of an accountant. It’s in his blood, big time. All these activities support the seat of the stool that is Money. Joel does not sell to supermarkets, Farmer Markets or Box Schemes. He explains that supermarkets will always push your margins right down on volume of sales. Profit is very difficult and they tend to call the shots once you are in their orbit. Farmer’s Markets are too hit and miss. People go to them to socialise rather than buy large amounts of food. You have to carry it off in a bag after all. You also have to pay each and every farmer present individually. It just isn’t efficient. He also doesn't do box schemes because you need a good variety of produce to satisfy the customer and they are mainly perishables. It is too risky. So how does this self-styled ‘lunatic’ farmer make such a healthy profit? Joel has managed to lure his customer to his farm. This is no mean feat given he is miles down a farm track in a valley in Virginia. He offers people lots of samples. He says it break’s people’s routine and prompts changes in behaviour. We all buy stuff habitually so samples are a key insight for him and they work. This idea of samples is particularly effective with restaurant chefs who are partisan. Once they know the ingredients for their recipes are good they become loyal. Then he has an ‘education’ programme. He has a Polyface Farm slide show / talk. He goes out and talks to: Rotary clubs, after dinner clubs, women’s clubs, colleges, parents groups in schools… If there is a potential customer, Joel will go and speak. Let’s face it, he’s a brilliant speaker. He’s entertaining, funny, as good as a stand-up comic at times and he makes people buzz with enthusiasm. It’s his mojo. If you ever get the chance to hear this man speak, just go. He’s a huge character. Lastly, he uses what he describes as ‘evangelism’. When a new customer calls the farm to order, the routine is to find out how they heard about Polyface. The idea is to identify the champions and reward them. He gives customers who recommend his food club or the farm shop free gift so produce or vouchers. He makes sure that are valued as ‘cheerleaders’ for the farm and he ensures they are thanked. Gratitude is a great motivator besides money off vouchers. Joel values the fact that he can offer a diverse product range like a supermarket. It makes ordering from Polyface a convenient, one stop shop. Supermarkets after all have got a lot right which is why the majority of people use them. Let’s take the lessons they have learned and adapt them to alternative enterprises. He asks, “What defines our tribe?” People who want good, organic, local food come in all shapes and sizes but you can guarantee that cooks, wellness centres, ‘quacks’ (he means alternative medicine practitioners like acupuncturists and homoeopaths), fitness instructors, gardeners… Joel describes the tribe as the ‘lunatic’ fringe and he counts himself amongst them with a huge smile. He unashamedly non-conformist, anti-regulation, freedom seeking… You get the picture. Polyface started selling eggs to restaurants by accident. A customer ordered a 100 layers and then changed her mind. Suddenly Polyface had 100s of eggs. Every day. They had to achieve volume of sales quickly so they wrote to 10 restaurants (pre-internet days). Six replied. Four placed a regular order after sampling the ‘best eggs from pasture-fed chickens in the world’. Then other restaurants heard about these delicious eggs and started ordering from Polyface. They have since diversified into cuts of beef, pork, rabbit and chickens. They listen carefully to feedback from the chefs they supply and retain their loyalty, even when they move restaurants. They also do a lot of PR. It’s worth it. The margins of selling quality hand reared produce to restaurants are healthy. You can charge a premium rate for a premium product to the top restaurants. These are simple city-based clubs. They are the ‘tribe’ but centred around a food hub. It works like this. Polyface has developed a product range. There are eight drops a year with a minimum order of $3,000, although in the first year the customers are given time to build up to $3,000 per drop. Polyface has set-up an online shop and there you can order your produce in your own time (It’s far more efficient than by phone as it is automated). There are scheduled 30 drops for 5,000 families in different areas eight times a year. The drop points are almost always private homes. Joel calls this ‘relationship mystique’. This is about gathering together a food community and servicing it. It isn’t about shopping. The food is stacked in coolers in a van straight out of the cold room. Everything is frozen. People are invited to collect their order and transfer to their own cooler at a specific time. Not a half an hour window. If the time is 10.00 am some are early and others appear by 10.15. After that time the delivery driver leaves and customers are charged $25 restocking fee. They either never buy again or pay up. Customers pay cash on delivery. They have 24 hours to make a complaint about the produce or a short delivery. Joel calls this ‘guerrilla selling’. Polyface charge 28c / lb flat rate delivery fee. By selling online the farm creates an electronic aggregate - there’s no infrastructure and expenses of running a shop and no staff overheads whilst people work out what they want to buy. Joel applies all his guile with samples and champions. He runs a recipe of the week competition and gets his customers competing to win the prize. He has a ‘One Hundred Percenters’ club and offers a gift for those who buy produce at every eight drops. He makes sure high spending clubs are also rewarded and aware of their high status in the system. Every customer who introduces a new customer gets a $10 voucher that is automatically pre-loaded at the online store. Some people make quite a career of recommending new customers. They receive around $400 a year in vouchers. But as Joel points out $400 to generate $40,000 worth of business is peanuts. I run an online business, Green Shopping, where we sell Permaculture magazine issues, subscriptions, our Permanent Publications titles in print and as eBooks, tools, green products that we like and books by other publishers like Chelsea Green. We use e-commerce software. We use social networks to reach our ‘tribe’. We also give away a huge number of samples (in the shape of free to download quality eBooks) and we discount stuff and run competitions. Our shop supports our publishing work and helps us run this website and gives away content every day totally for free. It is essence a very similar sales and marketing pattern to Polyface Inc. We had to develop it like this on the alternative edge because in the 1990s most people had never heard of permaculture, we had no funding to support our magazine and book publishing activities and zero budget to buy marketing services or advertising. What e did have was a website as early as 1995. We have always been technologically innovative. We out-innovate some very large and famous publishing houses. The conditions on the ‘edge’ that have driven Polyface Inc on the lunatic fringe, looking for their tribe, are exactly the same conditions that have shaped our company. I mentioned a little of this to Joel at the end of his workshop and we exchanged a supportive sense of camaraderie. It’s fun being a lunatic. It’s exciting operating on the edge. You have no choice but to be different than conventional businesses and therefore the unexpected manifests. We both love our tribe. Gratitude to you all for being there. Grateful thanks to the UK RegenAg team for organizing such brilliant events and to Cowdray Hall for their hospitality. My last blog about Joel Salatin next week will be about Polyface's organisation structure, accounting, specifically cost centre analysis and categorization. That’s accountant speak but it is key to a successful business, on or off the farm, and actually it is interesting stuff, honestly! It also gave me a huge insight into the man. 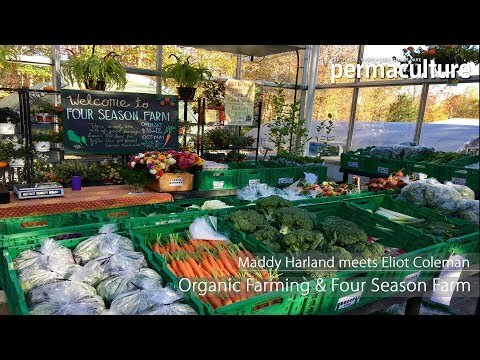 Maddy Harland on Joel Salatin's pattern for carbon farming at Polyface Farm. Maddy Harland is editor and co-founder of Permaculture magazine, a magazine that covers all aspects of sustainable living, from permaculture gardening and small scale sustainable agriculture to green building, low-impact transport and community action. Maddy Harland also co-founded Permanent Publications, a company dedicated to publishing environmental books. Maddy Harland is a co-founder of the Sustainability Centre in Hampshire, UK.